I know, I've talked about this book already, but I came across an interview with the authors on NPR, and I thought I'd bring it up again. This is a book that I cannot stop thinking about, and I love to look at it, even if it does tear me up inside. 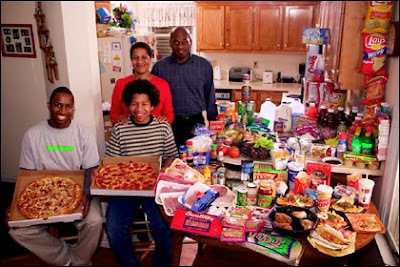 I would NEVER want to be pictured with a week's worth of our food. 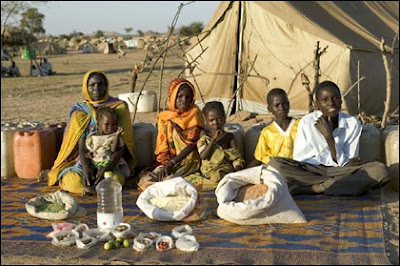 When I did a semester long research project in high school on eating disorders, I came across one researcher who believed that eating disorders were caused by extreme desire to show empathy for world hunger (and conversely, a disgust for American appetites). I considered it to be a total crock, at the time, but after reading this book I definitely could see how that might happen. 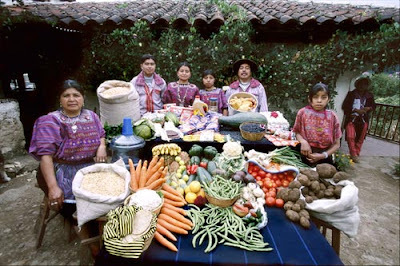 I would love to look more like the Guatemalan picture, which shows more emphasis on vegetables. I remember that the book shows a more rural Chinese family with a similarly wide array of vegetables, and a lot of variety in their cooking techniques. That's something I find most interesting. Countries with fresh markets buy food every day, using their daily stock constantly, and still maintain a huge variety in food preparation. Here, the farmer's market closest to me is only once a week, and if I want Zucchini from one particular Chinese lady I am going to pay and arm and a leg to get it. Otherwise, my only choices are tomatoes, some greens (cilantro and lettuce, usually), eggplant, turmeric, garlic, ginger, and fruits. It's hard to get more than that. I was very happy when I picked up a bag of Lychees, and he informed me that there would be mountain apples next week. But anyway, I still end up going to Foodland or Costco for most things, which means, inevitably, that some of it will go bad before I use it. It's depressing. Plus I spend WAY too much money on food. When I look at these pictures, I want to send all of my money to Chad. But I don't, because I'm afraid it won't get there. Today I'm making eggplant parmagiana and pasta. I had to buy the eggplant from Foodland this time, though, but at least the tomatoes and parsley are from the market. Everything else is costco. Argh.